VASCO: In a major haul, the air intelligence unit of commissionerate of customs and central excise seized unclaimed gold worth Rs 2.24 crore on two different occasions at Dabolim airport on Wednesday and Tuesday. As per commissioner of customs K Anpazhakan, both the seizures were made from Qatar Airways flight QR-522. 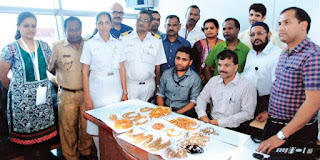 In the first instance, a duty-free plastic bag containing unclaimed gold, which included chains, bangles, kada, bracelets etc, was found in a dustbin of the rear toilet of the aircraft. “The total value of the 7.124wo kilogram gold seized on Wednesday was around Rs 1.70 crore,” informed Anpazhakan, adding, the customs sleuths detained some passengers on suspicion, but they were released later. In the second instance, two kilogram of gold bars, amounting to Rs 54 lakh, were seized on Tuesday. “The two gold bars were kept inside the pouch of a life jacket attached below a passenger’s seat,” Anpazhakan said. When asked whether there could be involvement of any ground handling staff of the airlines in smuggling the gold into Goa, the customs commissioner expressed such a possibility, but said it was too early to pinpoint anyone as the matter was in the primary stage of investigation. “The passengers, who are involved in transporting the gold in bulk to Goa from Doha or any other country, might have done it in connivance with the staff of the airlines and without which it is impossible to dare such a thing,” Anpazhakan said. Meanwhile, in earlier cases, he said around nine persons of the total 10, who have been arrested under Conservation of Foreign Exchange and Prevention of Smuggling Activities Act (COFEPOSA), would be sentenced to one year imprisonment. The accused were caught in Goa for smuggling gold on various occasions. “The COFEPOSA was passed by the Parliament in the year 1974 in order to retain foreign currency and prevent smuggling,” Anpazhakan said. Assistant commissioner of customs Rajiv Kittur is investigating the case under the supervision of commissioner of customs Anpazhakan.